James Tedford (Left Lane) and Jenna Barba (Right Lane) battle down the track for the win on Bike Night, Friday, July 21, 2017. Photo Credit Bill Morse / CWMWeb Photography. Gales Ferry, CT (July 21, 2017) – On Friday, June 30th when racers pulled into the New-London Waterford Speedbowl they had no idea it would take an additional three weeks before their season finally got underway. After weeks of weather related problems that delayed racing Fast Lane Fridays was finally able to run under clear skies. 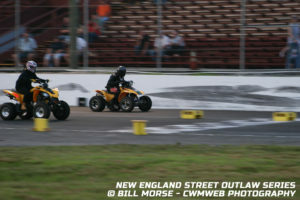 Double Eliminators for Outlaw and Street Class and Triple Eliminators for the Bike Class highlighted the opening night. Fogarasi, Wright, Brown, Lewis, Brockett and Barba were the six winners over seven events run tonight. 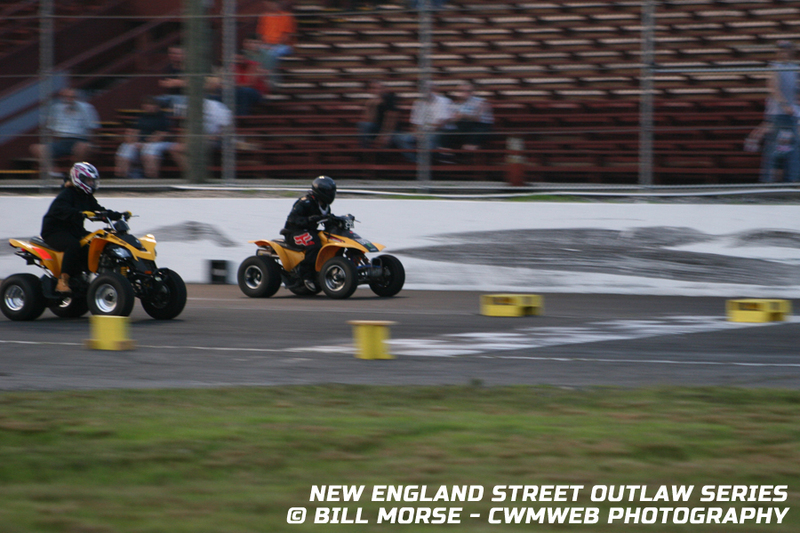 The first set of Outlaw Finals would see first time NESOS racer Joe Fogarasi, a former track Mini Stock competitor, paired against Gil Desjardins another first time NESOS racer. While the race was close at the line, Desjardins in his 1985 Chevy Astro van had a red light (-.032 seconds) in the right lane handing the victory to Fogarasi. The second Outlaw Finals played host to veteran racer Warren Wright paired against Peter Maccullouch. Mccullouch would dial in at a 2.67 and run a 2.67975. Even a quick run within a time of .00975 seconds to his dial-in would still hand the win to Wright who was quick in the right lane all night long. The first Street Class Eliminator Finals would have two veterans going head to head as Keith Brown and Heidi Bradham would outlast the competition to square off in the finals. Having a very consistent light and run down the track Brown would take the win with a fast reaction time of 0.00917 seconds from the left lane line. The second Street Class Eliminator Finals would again feature Heidi Bradham in her 1980 Camaro this time paired against challenger Adam Lewis in his 2014 GMC Sierra. Lewis would take the win having a slight quicker reaction time off the left lane line despite Bradham having a faster 60 foot and MPH. While it was the 2017 season opener it was also scheduled to be Bike Night, which saw the Bike Class getting a chance at three eliminators. The first set would see Nathan Booth paired against Deanna Brockett. A red light by Booth in the left lane would hand the win to Brockett who ran a consistent 2.604 ET in a 2.61 Index. The second Bike Class Eliminator would see Deanna Brockett again making the finals this time paired against Jenna Barba. Brockett would change her Index to a 2.68 from a 2.61 when in the left lane and would run a 2.63. The breakout would give Barba her first win of the night. The third Bike Class Eliminator would again see Barba advancing to the finals paired against former Bike Class Champion James Tedford. Barba’s consistent time in the right lane was no match for Tedford as she would pick up her second win of the night and in doing so would also capture the $100 bonus for winning two classes eliminators in one event. For complete eliminator round results and 2017 point standings please visit NEStreetOutlaws.com. Second Eliminators for all classes count towards the 6/30 posted Eliminator One. Next on the schedule will be Fast Lane Fridays, Friday July 28th that will feature Outlaw, Street and Bike Classes PLUS a special FWD vs RWD Shootout where all classes will be combined into one large eliminator to see who will be the last one standing. Racers are encouraged to review the 2017 rule book and complete their driver registration forms in advance and bring with them on Friday night if they have not submitted already. A download is available on NEStreetOutalws.com.